Education loans have always acted as a catalyst in facilitating opportunities for ambitious students and help them achieve their academic and career goals. Applying for a loan to fund their education is a tough exercise, which students need to attend very carefully. 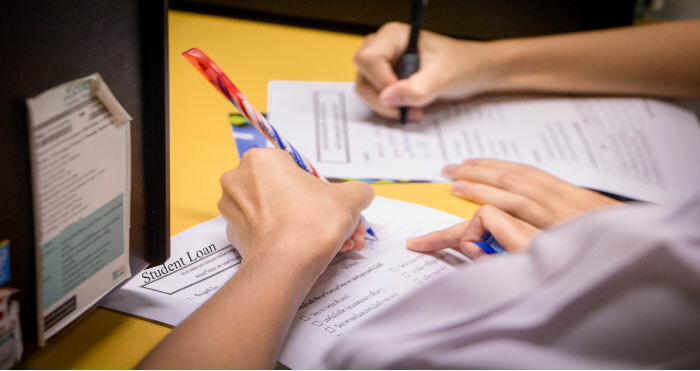 Information of education loan interest rates, application process and documents required for education loan is crucial to gaining the most beneficial service. To provide education loans, banks set a number of terms and conditions for applicants. Every aspiring education loan applicant needs to follow these terms and conditions to utilize the maximum services provided by the bank. This includes being ready with the complete authentic documentation (like KYC, marksheets etc.) for the official purposes. Although the documents mentioned have their own importance for each stage of loan application. But that’s not the necessary order of documents required for education loan. Following is the chronological order of documents required for education loan by the order of their relevance. What are the proof of identity documents required for education loan? Word of caution: It is mandatory to submit a proof of identity while applying for an education loan. Amidst the common discourse in the banking community about the identity proofs, there are certain documents which are considered as valid proofs of identification. Applicants and Co-applicants both need to submit their respective identity proofs. Identity proofs for education loan application do not only account for photo identity but also residence proofs. Following documents can be included as proof of identity along with education loan application. Some banks have a mandatory ruling of requirement for photo identity proof. Old PAN card without photographs or business PAN cards, or any other ID proof without the verifiable hint of photo identification will be rejected. What are the academic documents required for education loan? Banks require academic records of education loan applicants, to decide the interest rates offered to them. Students need to provide their past academic records to prove academic merit, so that banks can trust their loan repaying capacity. Not only the past academic records but students also need to present relevant documents of admission, including educational institutional profile. Such documents help students to not only apply for a better loan scheme but also avail various education loan tax benefits and interest rate subsidies. Records of past scholarships/awards etc. What financial documents do I need for education loan application? Education Loan applicants need to prove their financial viability to repay the loan in time so that banks can trust to provide them with their services. Sometimes banks allow refinancing of education loan to provide addition of loan amount, extended loan tenure or change in EMIs for ease of loan repayment. Appropriate financial proofs provided by applicants help them avail tax and other benefits. It is not mandatory for a person to be employed in professional service to provide the requisite financial evidences. Applicants from business background and self-employed sectors can also apply for theses education loans. What are the collateral documents required for education loan? Does every loan applicant need them? Though the central schemes for benefits to economically weaker and minority sections, instruct banks to provide an education loan without collateral, but for other sections of the society with higher demands of loan amount; collateral is required. Collateral does not only acts as physical guarantee for the loan; banks also reduce the education loan interest rate for applicants providing collateral guarantee. What are the other documents required for education loan application? Education loan application cannot be processed unless the loan application form contains all the relevant details. Apart from a complete application form, students also need to furbish guarantee documents and subsidy application forms for special benefits. Third-part guarantee is required for education loan when the student is applying for education loan without collateral or when the applicant is not a direct customer of the bank from which loan is being taken. What is an education loan application form? What details are there in a common education loan application form? Government of India and Indian Banking Association (IBA) have stated a few necessary details of education loan application form to organize the loan application process. This helps the students in saving time while filing their loan application. It also helps them to keep check on the least necessary information provided for loan application, maintaining their privacy and financial security. This is the reason why government education loan portal Vidyalakshmi has a ‘Common Education Loan Application Form (CELAF)’. Post sanction documents required for education loan- Do you even need them? Education loan documentation might seem very tedious but it is actually very easy based on the kind of loan that you’re applying for. Students only require a handful of the documents mentioned above for their respective loan application. The above stated information is to equip students with most information to have their loan processed very smoothly. Applicants also have this entitlement of adjusting their education loan margin payment and EMIs with scholarships. They can settle the requirement of margin for every loan disbursement (generally between 5-15% of disbursed amount). No extra documents are required for such transactions. All this information about the documents required for education loan is more than enough to help you get the best services. For more details on education loan eligibility criteria or interest rates you can search for Buddy4Study Edu-Loans. Happy Learning!